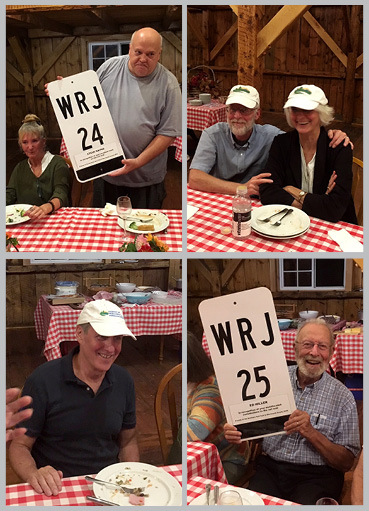 Five exceptional volunteers were honored at the annual meeting of the Friends of the Northern Rail Trail in October at the Andover Barn. (Top L to R) Steve Rayno, Trailmeister, Steve and Patrice Rasche, Ride Organizers, (Bottom) Ricker Miller, Maintenance Marvel, and Ed Hiller, Sign Afficionado. This year’s required Annual Meeting of the Friends of the Northern Rail Trail–Merrimack County took place on October 10, at the Highland Lake Inn in East Andover. Vice-President Alex Bernhard conducted the two-part meeting. To begin, the Membership of FNRT-MC re-elected all of the existing Directors for the coming year. Following this, the Directors appointed the existing officers of FNRT-MC for another one year term. Motions to effect these results were offered and unanimously approved–in the time period of four minutes between call-to-order and adjournment! Re-Elected Board Members are: Alexander Bernhard, Andover, Steve Darling, Andover, Tom Frantz, Andover, George Heaton, Danbury, Craig Heim, Wilmot, Charles Martin, New London, Myra Mayman, Andover, Chris Norris, Andover, Jack Shields, Penacook, Peter Southworth, Andover, Nita Tomaszewski, Franklin. Additional FNRT Member Present for Vote: Ricker Miller, Andover. Re-Appointed Officers are: Co-Presidents: Lindy Heim, Wilmot, NH and Myra Mayman, Andover; Vice President: Alex Bernhard, Andover, Treasurer: Steve Darling, Andover, Secretary: George Heaton, Danbury. The evening’s festivities began immediately after the business meeting, as Highland Lake Innkeepers Gail and Pecco Beaufays hosted a joyful and delicious Pot-Luck supper for about 30 friends of the Northern Rail Trail. As the term implies, the fare at a Pot-Luck is up to chance. But this year, we truly lucked out: cheeses, dips, deviled eggs, ham, broccoli salad, shrimp jambalaya, Spanish tortilla, lemon-herbed chicken, and German sauerkraut and pork were among the delicacies washed down with wines of various colors and waters and ciders. Desserts featured apple cake, blueberry tart, donuts and cookies. Amidst the general merriment, Co-President Lindy Heim offered a toast to a good year on the Trail, as well as special recognitions to friends of the Trail who have made outstanding contributions to maintaining the Trail and promoting its use. We encourage the public to attend our meetings (which are always open, and the results published), to inform us of any matters concerning the Trail, to contribute in all ways that they can – and above all, to use the Northern Rail Trail.